French pave rings bring with them a sparkle and beauty that other ring styles find hard to recreate. A French pave ring is a style of ring that features a large number of diamonds, set closely together which look like a paved street of diamonds. In some rings, the diamonds seem endless and the sparkle coming off of the diamonds is incredible. The French pave style has been popular for many years and is now making a comeback. The pave style of rings is in the Novori Jewelry web site in the Rings with Sidestones section and also as part of the Designer Rings section of the web site. As always, Novori offers a full 30 day return policy and free insured shipping. These French Pave rings are custom made to your order and can be modified to your desires. Just contact one of our jewelry experts toll free at 1-877-877-4141. You will be very surprised at how affordable these rings can be. French pave rings are very affordable because the diamonds that are used to create the paved diamond look are smaller and less expensive than regular diamonds. If you check and compare, Novori always uses high quality side diamonds in all of our rings. No matter if you call these rings French Pave, micro pave or simply pave rings, the sparkle and dance of the many diamonds on the ring will demand the attention of others. 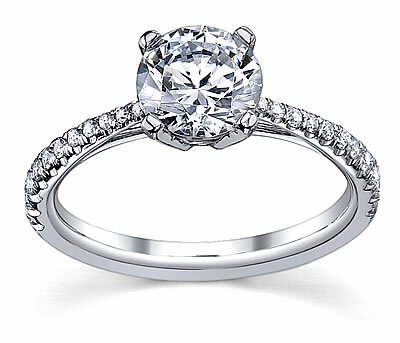 Let us help you find the engagement ring of your dreams and the GIA or EGL certified diamond for the perfect ring.